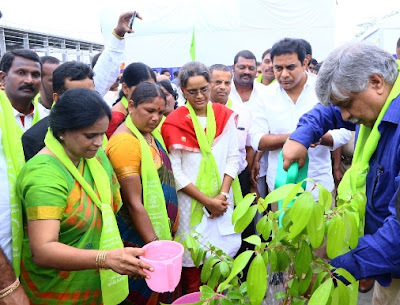 ITC Limited today reinforced its commitment towards the enrichment of environmental resources by planting saplings at its Integrated Consumer Goods Manufacturing and Logistics (ICML) facility in Telangana, as part of the State Government’s ‘Haritha Haram’ initiative. Sri K. Taraka Rama Rao,Hon'ble Minister of Information Technology, Industries & Commerce, Municipal Administration & Urban Development, Mines & Geology, Public Enterprises & NRI Affairs, Governmentof Telanganawas the Chief Guest and planted saplings at the ITC – ICML site. Among the other dignitaries present at the event were Sri Arvind Kumar, IAS, Principal Secretary to Government, Industries & Commerce, Mines & Geology and Energy, Government of Telangana; SriK Manicka Raj, IAS, Commissioner of Industries, Government of Telangana; Sri E V Narasimha Reddy, Vice Chairman & Managing Director, TSIIC, Government of Telangana; Sri Chitranjan Dar, Group Head of Projects, R&D, Environment Health & Safety, ITC Limited. On July 11th 2016, ITC’s Paperboards and Specialty Papers Division (ITC PSPD)partnered with Telangana Government in their mega plantation drive by planting 8.5 lakhs saplings. As part of the initiative, ITC will also share GPS coordinates of the aforesaid plantations, as well as ensure maintenance of these plants for the next three years. For over a decade, ITC Limited has remained at the forefront of Sustainability performance by adopting innovative models that contribute significantly and meaningfully to the creation of environmental and social capital. It is the only Company in the world of comparable dimensions to have remained Carbon, Water and Solid Waste Recycling Positive. This performance is the result of a larger vision to contribute to the Triple Bottom Line objectives of building economic, environmental and social capital. ITC’s large scale Social and Farm Forestry has also helped in the greening of more than 2,25,000 hectares and has created more than 100 million person days of employment.This initiative is a flagship example of an innovative model crafted by ITC to make a meaningful contribution to social and environmental wealth creation. On one hand, this initiative provides sustainable livelihood opportunities by enabling marginal farmers and tribal to convert their rural wastelands into pulpwood plantations. On the other hand, these plantations have played a major role in maintaining ITC’s carbon positive status for the past 11 years through large scale carbon sequestration. Over 5122 Kilotonnes of CO2 were sequestered in 2015-16 alone.